The pup, seen cheering on runners with a pair of flags, has gotten a lot of attention. 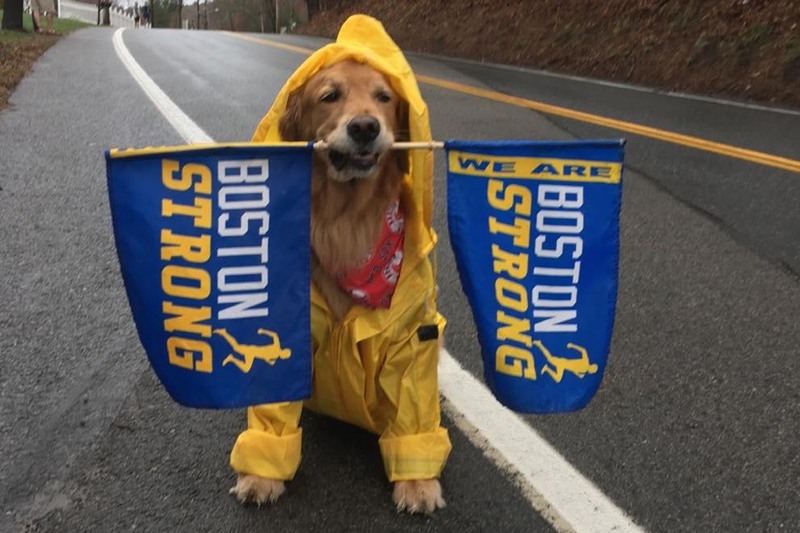 By Spencer Buell·	 4/17/2018, 11:05 a.m.
Update, April 15, 2019: We are thrilled to report that Spencer the flag-waving dog is back on the race route for 2019, this time sporting a stylish yellow rain slicker and carrying a blue-and-yellow “We Are Boston Strong” flag in his jaws. 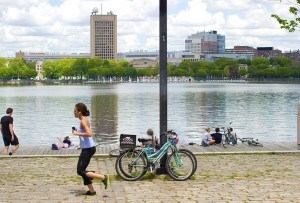 You can find him about two-and-a-half miles in on the right side of the course. Good luck out there today, big guy. Earlier: There were a lot of big stars of yesterday’s 122nd running of the Boston Marathon: Like Des Linden, the first American woman to win in 33 years, and Tatyana McFadden, who is once again a champion after dealing with some tough medical issues. But among canines, there is one very good boy from this year’s race that stands out from the rest. And that’s Spencer, the flag-waving therapy dog who has officially enchanted the entire world. Spencer’s owner Rich Powers, of Holliston, posted video of the pup on Monday, in which the well-trained golden retriever can be seen sitting atop a wooden box, swathed in a Columbia rain jacket, and chomping down on a pair of flapping blue-and-yellow flags reading “Boston Strong,” as rain-pelted runners make their way through Ashland. We were among the many who were smitten with the little guy, and included him in our round-up of the best dogs we saw yesterday. Ever since, Spencer has become a star. Video of the little guy has been viewed more than a million times, he’s been featured on The Today Show and in local reports, and now international media is taking an interest. Powers, 53, who runs a photo studio specializing in pet photography, says he never expected that Spencer’s third-annual appearance at the Boston Marathon would go viral, but he’s thrilled Spencer has managed to bring a lot of joy into the world. Runners were definitely in need of a pick-me-up yesterday, as weather conditions made running a challenge and left thousands stricken with hypothermia. Powers says plenty of chilly, soaking wet athletes had big smiles on their faces when they ran past and spotted the one-dog cheering section—some of them stopped for a photo, or to give Spencer a big kiss. So Powers says he was happy to spend the entire race out there with the flags gripped in his jaw, offering some encouragement during the grueling race.